​Despite studying Japanese for more than twelve years starting as a first grader, it wasn’t until college that I was introduced to Aikido. How did I go so long exposed to this culture without ever hearing about this treasure? Aikido embodies the essence of the Japanese heart and mind of which I feel deeply connected. I’d like to share just how pervasive this Way has influenced me in regards to understanding deep truths about the Universe. After being entered into the lottery system, I got selected to go through the program. Even at that young age, I remember feeling honored and wondered how this influence was going to change the course of my life. The variety of experiences that came from the program were incredible. 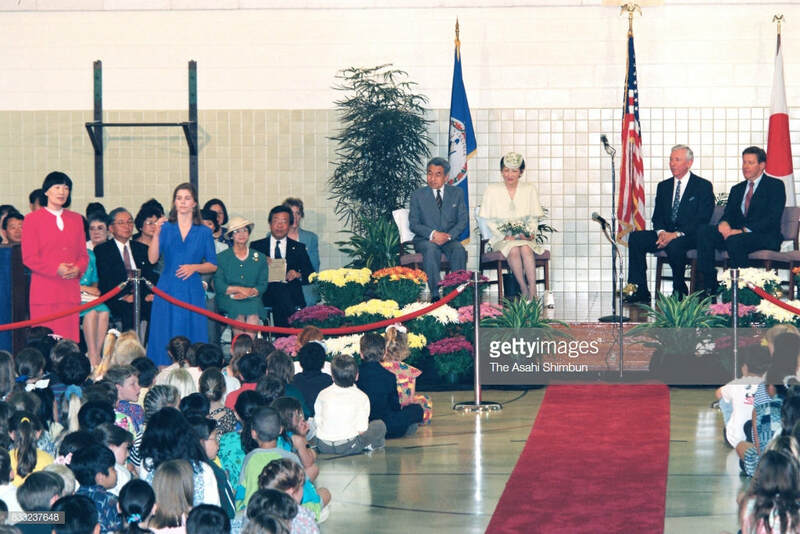 We even met the Emperor and Empress of Japan in 2nd grade when they came to our school to see what we were doing. Given it was the height of the Japanese economic boom, I always thought it was going to lead me into business opportunities. That did not turn out to be the case thus far however I feel like I struck a much bigger fortune by finding myself drawn to the spiritual and philosophical aspects of the culture especially Zen and Aikido. Once we entered into middle and high school, the remaining students in the program ended up simply continuing Japanese as a language. However, during those years we did finally get to travel to Japan on multiple occasions and get first hand exposure to the people. The first trip I took there was focused on the spirituality of the Japanese people where we explored numerous Buddhist temples and Shinto shrines. I remember pushing for a more business oriented curriculum and yet fate would have it that understanding Life from the Japanese perspective took priority. Despite this and a few other trips, there was still no mention of Aikido from what I can recall! After high school, I attended Virginia Tech University which unfortunately did not offer advanced Japanese as a language. I went two years without much attention placed on what the culture had more to offer me. At the same time, I started to feel the need to find deeper truths about my Self and Reality as a whole. Zen Buddhism took precedence in my initial inquiries as it became clear to me that meditation was the key to gaining direct insight into true nature. My mother played a critical role as guide for me at this time as she got me into specific practices, pointed to books and shared her own experience. It was around this time that she mentioned a Japanese martial art called Aikido after she heard Richard Moon Sensei speak at a Human Resources conference that she attended. As soon as she uttered the words, I recognized it to be a critical part of my calling and so I ran with it. Like all martial artists do when they hear the call to train, I knew I had to find an authentic dojo to start training as no book was going to convey what I was looking for. So I ended up discovering Saotome Sensei’s Ueshiba School of Aikido in Washington D.C. and traveled over an hour away to start training. 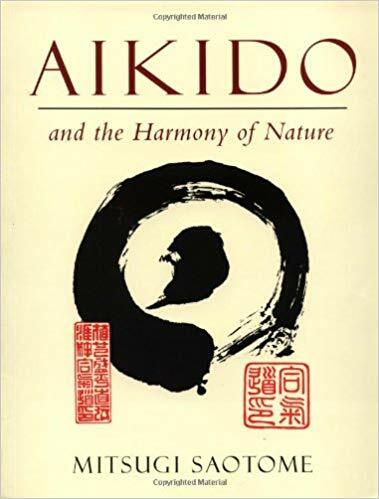 His book The Harmony of Nature provided critical orientation for me in explaining how Aikido could be adopted as a spiritual and philosophical path. Believing that to be the case, I dove into training with this perspective and continue to dive deeper knowing that greater truths will reveal themselves with diligent training. ​When starting out, I remember feeling a great sense of confusion with how my own body worked. This was fascinating to me as it forced me to drop my conceptions of what I thought I knew. Reflecting on this now, I see how a beginners mind is essential to learning and progressing on the Path no matter how far along someone has come. During my Junior year in College, I decided to study abroad in the Kansai region of Japan between Osaka and Kyoto. I had started my Aikido journey but despite my efforts to find a dojo there it was an allusive search. I instead joined the Judo Club at Kansai Gaidai Univeristy as I heard that O’Sensei sought integration of other martial arts so this exposure could only be a good thing. While abroad for that semester, I spent much of my time studying and practicing Zen both at the Univeristy as well as in Kyoto with a western teacher. I knew that to get grounded in emptiness as the ground of my being was going to allow me to pursue a path of full engagement in the world. It became clear that I needed to essentially go back to before the Universe was created inside of my Self and that Zazen or “just sitting” was the vehicle to enter into that dimension of reality. During the breaks that semester, I atteneded my first long meditation retreat at Antaiji monastery in Hyogo Prefecture and went on a Pilgrimage to the other notable Zen Temples specifically of the Soto Shu founded by Dogen Zenji across the country. It continues to be my belief today that meditation forms the basis of a strong Aikido practice in the sense that the universal energetic flow of energy that we seek harmony with continuously emerges out of that empty ground or pure consciousness. By letting the content of consciousness go repeatedly, it reveals the unfettered awareness of the present moment and allows us to see how we must respond most appropriately with spontaneity. This is essentially in my opinion was what O’Sensei was referring to “Takemusu Aiki” as the goal in this Way he defined. Upon my return to the US with an increased groundedness, I was more dedicated than ever to pursue Aikido as a means to knowing my Self in the dynamic unfolding creative process of Life. I continued to attend classes here and there at various dojos in Northern Virginia but it wasn’t until going back to College for my final year did I find a group to train with regularly. In my mind, this was really just preparation for what was to come next. I knew that I did not want to start a career immediately after graduation. Japan was calling me back this time to dedicate myself whole heatedly to training in Aikido. While I explored ways to get an English teaching job that would send me over to Japan, I decided that I needed to go directly to the source of Aikido first and then find work from there. Luck would have it that my University would hire me to lead a student group to Japan for two weeks right after graduation. This was the perfect transition to move to Iwama right after that trip was complete. I did not have a strong sense of lineage at the time given that my exposure to Aikido was somewhat scattered. From my research online, I realized there were three different groups in Iwama accepting uchideshi or “live in students” - the Old Dojo, Hitohiro Saito Sensei and Nemoto Sensei. I needed to work while training as an uchideshi so Nemoto Sensei’s Aiki House which was across town from the Old Dojo would be a better fit. I realized too that I could get the best of both worlds at the time by training with Nemoto Sensei who was one of the highest ranking disciples of Saito Sensei notorious for his gymnastic like ukemi while also training at the Old Dojo with all of the other Sensei’s at night. So I dedicated myself to earning my black belt before I left Iwama which would end up taking about 15 months training pretty much twice a day, every day. My typical day would start by getting up at 4:30am to bike to the Iwama Budokan across town to clean then train for two hours both taijutsu and weapons. After the initial summer, I did end up getting an English teaching position for a semester and then, ironically, a job as a golf caddy at a professional course in the next town over for the remainder of my stay. So after training in the morning, working during the day and then coming back home for training again in the evening, I progressed rapidly with my technique and understanding in preparation for my black belt test. ​During this onslaught of personal development, my meditation practice remained as a key factor in my pursuit of Truth. I found a spiritual teacher of a path called Evolutionary Enlightenment back in the US that gave a newly integrated perspective on the role of meditation as the means to becoming an increasingly conscious, whole participant in the life process which was in perfect alignment with my efforts in Aikido. My mantra at the time in that context was freedom means finding peace in having nothing, knowing nothing or being nowhere. At the same time, I was reading a tremendous amount of Integral Philosophy to further my conception of how everything connects and can be conceptualized as a cosmic process of which we are participants. Aikido in this sense is one of those methods that can enable one to cultivate a mind, body, and spirit dedicated to serving the continued progress of the Evolutionary Process in all domains of reality - self, culture and society. As I was realizing this during my Aikido training in Japan, I started to see myself as an Evolutionary Samurai (which means “to serve”) where my actions in the world can directly effect the future course of the Universe. It’s thus our responsibility to train diligently to become fit and open vessels for our most profound contribution to be realized. These more western influences of mine were constantly being integrated with O’Sensei’s teachings. John Stevenson’s books and online videos were extremely helpful as a guide to gaining more understanding and attempting to integrate O’Sensei’s teaching and esoteric practices such as Kotodama. I found that the explanation of this practice that O’Sensei was dedicated to was something that I should also adopt especially during my committed training period. So before each night class at the Old Dojo, I would stop off at the Aiki Jinja (“Shrine”) and chant with a full breathe from my Hara or belly “Su” which was seen as the original emanation of the cosmos from nothing into creation. Also, “A - O - U - E - I” which represented the core sounds of human expression in the Universe given these vowels are inherent in all languages. It still makes total sense to me that if we conceptualize ourselves to be one with the Universe that tuning our vocals out loud can be one of the most direct means and connecting with your Higher Self. The other chant which summed up O’Sensei’s motto that I chanted a lot was “Masa Katsu, Agatsu, Katsu Hayabi” which translates to “True Victory is Self Victory, Day of Swift Victory.” In this path of Aikido, the primary objective is to harmonize and integrate yourself with the Universe by overcoming a sense of separation that our Ego perpetuates. This is a moment to moment endeavor and deeper realization of this which is the goal can be done at any point along the Way. Just to note, The Spirit of Aikido by Kishomaru Ueshiba, the founder’s son, was another one of those contextualizing reads along my Path while training as an uchideshi that should be gone through by any dedicated student. Of course there were many trials and tribulations that tested my dedication along the Path while training as uchideshi including breaking my forearm in two places from a yokomen at the Old Dojo by a big German guy. This took me away from training for 6 weeks however it did give me a much needed rest which we all need and allowed me to further dive into my studies. Unfortunately too, my mother got diagnosed with cancer mid way through my training which eventually pulled me back to the US to spend more time with her before her eventual passing. With black belt in hand, I felt as though I finally had become a dedicated student of this Way of Harmony. And yet, it was just the start of a life long journey to continue to understand how the Universe works through us as fellow travelers on our respective paths. As I cross the threshold of third degree black belt, I continue to reflect on this most dedicated time in my Aikido training and strive to extract additional wisdom from it that can be applied to my own further evolution and those around me that hear the same call. 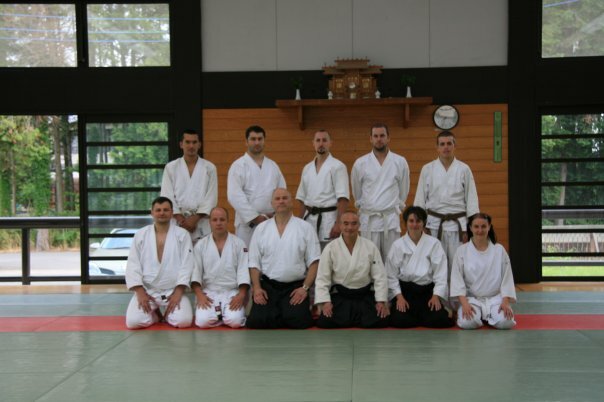 I’m especially excited about stepping into a teaching role to further clarify my perspective, principles and insights at the Aikido Institute. This dojo in my opinion really embodies the collaborative and community oriented nature of our Art. It will be an honor to contribute what I can to this pioneering organization.